There's a lot that you can complain about the Twilight movies. One thing that most people agree about uniformly is that the soundtracks are great. They feature popular artists but primarily focus on hip indie artists, some of whom are well known and some of whom are not. I have loved each Twilight soundtrack. Breaking Dawn Part 1 is no exception. It has songs by several groups that I really like and I'm also planning on picking up albums from new groups I've discovered through the album. Even the songs that I don't like as much are beginning to grow on me. *I've linked to a YouTube version of each song. 1) Endtapes by The Joy Formidable: The Joy Formidable is a group that I fell in love with over the past year ("Cradle" is my favorite song). I was thrilled to see them on the soundtrack. Endtapes is like the rest of their songs: a bright, joyful mixture of pop and harder rock. It's a fun song although not as memorable as some of their tunes. My only problem with it is that there is a big pause about halfway through that sounds like the song is over. It's awkward. 2) Love Will Take You by Angus & Julia Stone: Love Will Take You is a quiet, sweet song. Like most of Angus & Julia's songs, it has a folky feel to it. The sound reminds me of The Weepies. The beginning of the song has a big trumpet solo that doesn't fit with the rest of the song, but I really liked it. 3) It Will Rain by Bruno Mars: Meh. It's a nice song and a good single for general radio. It's just not my style of music. It feels like a mixture of R&B and pop. Perhaps I'm a snob because I do prefer indie artists. I don't hate the song and I won't necessarily skip over it, but I don't think it fits well with the rest of the songs on the album or the other soundtracks. 4) Turning Page by Sleeping At Last: A slow ballad (I suppose all ballads are slow but this one feels very slow). Turning Page is very pretty. I love the piano and strings - better than the vocals. The lead singer Ryan O'Neal sings in falsetto for much of the tune. It feels a bit too precious. I prefer my slow songs to have a melancholy, bittersweet edge. I do love the lyrics - syrupy sweet and all - "Your love is my turning page...Every kiss is a cursive line/Every touch is a redefining phrase." 5) From Now On by The Features: I wasn't familiar with The Features before this, but I will definitely look more into them. From Now On is an upbeat, fast rock tune. It has a classic rock feel to it with a good guitar line and strong drum beats. I really like the lead singer's voice. It's one of the happiest songs on this album. 6) A Thousand Years by Christina Perri: This song was a pleasant surprise. I seem to be in the minority of people who don't like Christina Perri's voice. It grates on me for some reason. I didn't like A Thousand Years at first, but it quickly grew on me. It is the song on the album that keeps getting stuck on my head and the longer it remains there, the more I like it. I still don't love Christina's voice, but I like the pace of the song. It's slow but has a steady beat and a very catchy chorus. I also love that Christina is such a big Twilight fan. No artist is more grateful to be a part of this soundtrack. 7) Neighbors by Theophilus London: A hip-hop/rap song on a Twilight soundtrack. Now that's new. I heard a few Theophilus London songs prior to this one and enjoyed them, although I'm not really into rap. It's hard not to tap your foot to this song. It has a very strong beat. I think this would be a perfect song for the wolfpack. I particularly find the lyrics "Promise to be a good neighbor" ironic. 8) I Didn't Mean It by The Belle Brigade: Love this one. A classic girls' rock song. Feels upbeat and girl-powerish while also being hard-hitting and bitter. I was surprised to read the band being compared to Fleetwood Mac, The Beatles, and Simon & Garfunkel on Wikipedia. This song definitely has a much harder feel. I'm curious about their other tunes. 9) Sister Rosetta (2011 Version) by The Noisettes: My favorite of the rock tunes on the soundtrack. Similar to The Belle Brigade song, this is a tune with a joyful, soul-influenced sound with defiant lyrics. Twilight is even mentioned incidentally: She's a caged animal / London by night / Crashing lights and cymbals / Queens of twilight. I'd vaguely heard of The Noisettes before this, although I'm not sure where. I'll definitely be checking them out more. 10) Northern Lights by Cider Sky: Cider Sky is totally new to me. I think it may be pretty new overall. Their first album is being released today. They don't even have a Wikipedia page. After listening to Northern Lights, I can't wait to hear their new album. The group definitely has an Indie feel. I can't explain why, but it fits the Indie pop rock genre perfectly. It sounds like a male and female duo. The song relies mostly on their voices; piano is the most prominent instrument with some bass and marimba (?). It is the perfect pace - neither fast nor slow. A very happy tune. 11) Flightless Bird, American Mouth (Wedding Version) by Iron & Wine: I love the tie-in to the prom song in Twilight. It's the perfect wedding song. Iron & Wine is one of my favorite bands. Sam Beam is a fabulous lyricist and singer. This version feels very personal. Like I'm in a little jazz club sitting in the front row with Sam Beam signing a foot away from me. I prefer a folky feel over a jazzy feel, but it fits well with the wedding theme. 12) Requiem On Water by Imperial Mammoth: Another new group who also lack a Wikipedia page. Like Cider Sky, Imperial Mammoth sounds very Indie. Also a male / female duo. They compare themselves to groups like Arcade Fire, Passion Pit, and The Civil Wars on their Facebook page. I don't see the similarity to the former two groups from this song, but I definitely see the resemblance to The Civil Wars, another favorite group. Imperial Mammoth is a quieter song than Northern Lights, but the steady guitar melody keeps it from feeling like a ballad. 13) Cold by Aqualung and Lucy Schwartz: My favorite song on the album. Cold is my idea of a slow song. No syrupy sweetness here. Instead it is hauntingly beautiful. Every time I listen to this song, I end up closing my eyes simply to enjoy the bittersweet melody. Aqualung is another group (really just one singer: Matt Hales) that I've heard of but I don't know why. Lucy's voice stands out than Matt's in this song. I love her voice, which manages to be quiet yet clear and strong. 14) Llovera by Mia Maestro: I love that one of the actors (aside from Rob) is being featured on one of the Twilight soundtracks. Mia plays Carmen in Breaking Dawn. I also like that the song is in Spanish - although Portuguese would be more appropriate given that they go to Brazil for their honeymoon. Mia has a gorgeous voice and I like the gentle piano and strings accompaniment, but this song is too slow and precious for my taste. 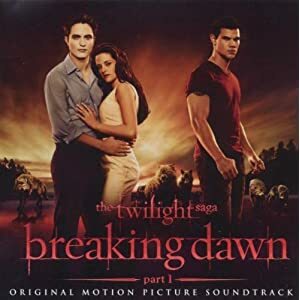 15) Love Death Birth by Carter Burwell: Unlike most of the instrumental songs that have been featured on the Twilight soundtracks, this does not keep to a single theme. Rather it's like an overture for the score. It tells a little bit about the entire movie - as you can guess from the title. I love the tie-in of Bella's Lullaby into the song. If you like movie scores, you'll like this. 17) Turning Page (Instrumental) by Sleeping At Last: Why? It's not the best song on the album. Were they aching to find one more song for the bonus tracks? I'd like to hear an instrumental of A Thousand Years or Cold more than this one. 18) Eclipse (All Yours) by Kevin Teasley: This could also fall in the "Why?" category, but I loved the Eclipse (All Yours) theme so much in the last album that I'm thrilled to hear this instrumental. It's one of my favorite tracks on the album. It's a mixture of piano, cello, and percussion. The cello is playing the melody. It's beautiful and sweet. What do you think of the soundtrack? I have to agree about the bonus songs. I was kind of disappointed with that. I do like the Christina Perri song (I think it is featured in one of the trailers for the movie) and though I usually don't like Bruno Mars, I did like this song for some reason. I am super excited that Carter Burwell did the score for this movie because my favorite part of the first movie was the score (and soundtrack). I was disappointed with Howard Shore's lackluster score for Eclipse since he did such a phenomenal job with Lord of the Rings. I am hoping that Carter Burwell's score will be much better. I didnt listen to any of the songs on any of the tracks yet (i've never been a soundtrack person) but I think I should be. I mean, if you like the movie, and you like the songs, why not get the soundtrack! I'm definitely love the soundtracks much more than the movies. I get a strong sense that the people behind the music understand the book much more than the screenwriter. I can't wait to get my hands on the soundtrack! Like you, I discover new bands to explore and enjoy. Thank so much for your review, Alison! Really? I love Christina Perri's voice. Glad it grew on you. EEEPP! Loved that you put each song along with other info. I was dying to know what it exactly on it. Your the best! not my favourite movie soundtrack but i love Iron & Wine as well! I'm with you on Christina Perri, I haven't liked her other work, but I do like this one. It's a beautiful song. I like the Bruno Mars song okay though don't really care for his video. I love the wedding song! I like the one extra instrumental Turning Page. The other one I really liked was the one in Spanish. I wish I could understand it, but it was so beautiful anyway! You make me want to dig my books out and read them again!